We just licensed some great stuff for Cinema Insomnia (our Horror Host TV Show) featuring Mr. Lobo. The theme song for Cinema Insomnia will be available for digital downloads this Halloween! It will be available through Itunes, Amazon etc. We've got a couple of more Cinema Insomnia related songs that we're finishing up the deals on for the digital market as well, I'll keep you posted as things progress. We also just licensed Orlok The Vampire in 2D to run on Cinema Insomnia this year as well. 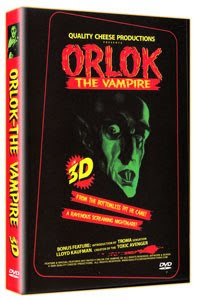 If you can't wait for the Cinema Insomnia version of Orlok The Vampire in 2D you can pick up Orlok The Vampire in 3D right now from http://www.thegrindhouse.net/ (The 3D DVD has a 2D version as well).